With the 2014 season winding down we take a final look at some recent results and news. In the Marblehead Class our 'pimped' Paradox enjoyed a win at the one day Watermead ranking in early August. This project continues to provide enjoyment in showing just how competitive well designed older M's can be with reasonably inexpensive upgrades. Report here. A report in from Belgium has highlighted a win for our IOM SKA plan design by builder and skipper Kris Panis. Kris has been working hard with club members locally where a number of SKA hulls were produced and it is great to see him achieving a well earned Nationals win. Closing out 2014 we reflect on another fantastic year with goals realised, whilst knowing there are always more challenges ahead. For 2015 we will finally have new IOM and Marblehead design plans available in January. The 2015 IOM Worlds in the USA are fast approaching and we working on further refinements to be tested on our POP prototype IOM project. Aside from these and other exciting projects, our primary aim and focus is to continue providing our loyal and new customers race winning sails, designs and equipment. 2015 will be our 17th year and we again thank you for your continued support. We will be taking leave from the 17th of December through until the 5th January to recharge the batteries for 2015 and beyond. We wish all a Merry Christmas and good sailing for 2015! With Autumn now closing in we can reflect on our year to date and what lies ahead in the coming months at BG. On the Sails side our new sail order lead times have been further reduced allowing our customers old and new to better schedule their orders with calendar events and planning. We are now trialling a new 'BG Emergency' initiative where existing loyal BG customers require prioritised replacement for a damaged sail for an upcoming event. Terms and conditions are attached to this initiative but we are aiming to better look after our loyal customers who support us as best we can. Email for more information. Along with this we are fine tuning the listed items we supply in our online shop to best help us meet sail order demands as a priority. Keep an eye out for regular updates and item changes where we hope to soon have new IOM and M lines plans available for home build in the coming months along with other items such as pre-cut deck patches. July saw the Marblehead Class World Championships held in the Netherlands and another win for our BG Grunge design. Conditions were generally light shifting A rig across the week but for one day of B & C rig in gusting winds. Grunge leading from day 1, once again showed its ability across the conditions to claw back places from some average starts at times, and offer the confidence in speed to sail a calculated event without having to take high risks to retain the World title and keep its 3 year undefeated event record intact. BG Sails were also used by Peter Stollery for his 5th place finish, and Darin Ballington who we have worked closely with in upgrading his 15 year old Bantock designed Rok for a well earned 8th place, giving us 3 boats in the top 10. Matteo Longhi also using BG Sails notably managed a 1,2 in A fleet over the week along with Henning Faas of Germany racing BG's 2006 Anarchy with updated BG Sails to a solid 16th place from 68 competitors to be leading German skipper. Over the bank holiday weekend of 23rd-25th of August, the UK IOM Nationals were held on the Queen Mother reservoir near London Heathrow. Conditions ranged from top end of A rig on Day 1, Light to near nothing on Day 2 and Light to mid range A rig and constant rain on Day 3. After 3 days of racing it was Tony Edwards with his Britpop and BG Sails who took the event with some excellent racing using smart positioning and good speed for a well deserved win making it 4 years in a row for the Britpop design with 3 different skippers. Our POP and its driver had an up and down event with a less than flattering first day but ultimately after drawing level on points with Tony early Monday, faded away in the afternoon to take third overall. 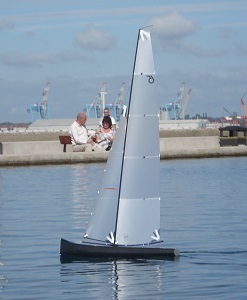 Tony, son James and BG were all using prototype foils by Robot Yachts (James Edwards) that after outings at the Midlands ranking (BG), and the Nationals result, are looking to be close to our aims. Further open water trials are planned with lower rigs and differing bulbs before any final sectional designs are settled on and plans any on production are announced. Tony was also using a new 2014 development of our 36micron lightweight A jib, working to give better shape control across the wider anticipated wind range. This jib is now our standard lightweight jib cut. POP continues to offer valuable feedback on the small design changes made to an original Britpop hull. A few further tweaks are planned with the setup for upcoming events to continue along the design learning curve for the future with POP but we remind everyone that there is no push to replace our still dominant Britpop design any time in the near future. And finally we can report that our first RG 65 design prototype 'electronica' has had its first sail in a light A rig breeze and all looks as hoped. The coming months in between an IOM Euros in Italy and a 2 Day Fleetwood Marblehead ranking will offer the opportunity to learn and trim the design package before looking to any next step towards competition or production. Many thanks to James Edwards of Robot Yachts for an immaculate clear pre-preg carbon build of our design and his impressive foil package. To date, 2014 has been one of heads down and getting on with things at BG with a full schedule of International and National events now upon us. Sail orders have kept us extremely busy and we continue to work hard to reduce lead times. On the event front, we have the Magic Marine Marblehead World Championship in the Netherlands from July 5-11which has had our full focus on racing this year. A quality fleet of 70+ boats are expected with a group of 15 skippers from the UK making the trip for some world class racing. This is a great effort for the UK as the class here continues its growth through a dedicated team of owners and the UK class website. Later in the year we have the IOM European Championship taking place on Lake Garda from Campionne that looks to be another hotly contested event with worlds best skippers coming out to play being only 6 months prior to the 2015 Worlds in the USA. Tied in amongst this are a number of quality Ranking and National Championship events here giving us little rest. We have tried to best follow the results of our designs and sails around the world and are pleased to see continued winning performances at all levels of racing. - The Britpop in its fourth year continues to lead the way in the IOM class as the all round design of choice, continuing to consistently gain podium finishes at the highest of levels. - Our Grunge Marblehead design remains unbeaten in events since its launch in early 2012, recently winning its 3rd UK National title. - Trance, our first attempt at the 10 Rater class in design built and prepared meticulously to our specifications by Scott Condie, has remained unbeaten in Australia since taking the National title in its first event sailed in January 2014. The design will continue to undergo an amount of exhaustive testing and refinement before any decision is made on whether it may be suitable for production. - Due to our commitment to the above International classes, the Electronica RG65 design has had to bide its time until the upcoming prioritised events have passed. Mouldings of prototype hulls and components are completed and the only thing required are a few more hours in the day. 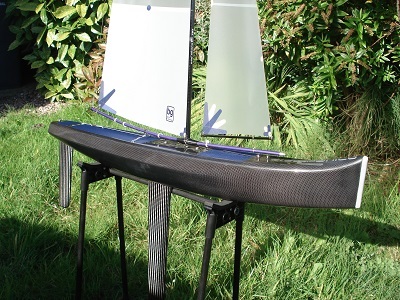 - Our sail shapes and designs continue to show their versatility in not only winning races at all levels on our own designs, but proving easily adaptable to a wide range of other designs allowing our customers a performance gain directly related to what we know to work best for any given class. As with all of our products, be sure to look for our BG logo, or that what you are buying is a genuine BG designed product if you are serious about your sailing. We are often informed by friends around the world of a growing number of imitations of our work and ask that skippers beware of inferior products that are reflected by their often poor performances.